Tags are keywords that you can give to artefacts, pages and collections in your portfolio to find them more easily later on. A site administrator must have the tag cloud enabled for you to use this feature. You can select tags easily from a drop-down menu. If you already added tags, you see them in the search box. You can remove them by clicking the little x to the left of the tag or by deleting it with the keyboard’s Delete key. … a drop-down menu becomes visible in which all the tags are shown that have this letter or letter combination. Select the tag that you wish to add to your list of tags. Tags that you already selected are highlighted. The number after the tag indicates how many times you have used this tag already. Save the page for your tags to be added. If you do not already have a tag in your list, you can type your tag and hit the Enter key to transform it into a tag. It will be added to your list of tags once the page is saved. If you use the tag “profile”, the tagged artefact or page is added to your profile sideblock as a shortcut. 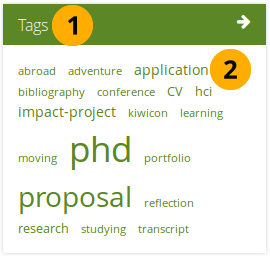 You can see your tag cloud in the sidebar when you are in the Content and Portfolio areas. Configure how many different tags you wish to display in your tag cloud in your account settings. Click on the Tags heading to be taken to all your tags. Click on any tag to see all artefacts and pages from your portfolio area that have this tag associated. The more you use a tag for your files, journal entries and pages, the bigger its font size gets in the tag cloud. On the My tags page you see all your tags and the artefacts and pages associated with them. You have a number of filter options to show only the resources that you wish to see. Sort tags alphabetically: The default view is to sort your tags alphabetically. 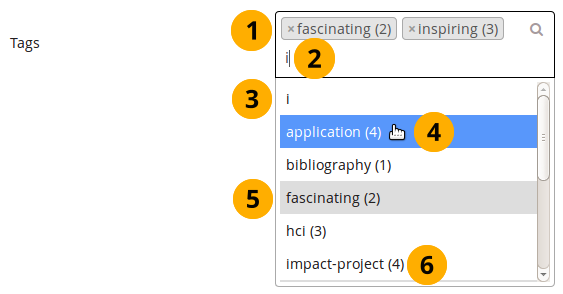 Sort tags by frequency: You can also sort tags by frequency showing the most frequently used tags first. You can click on any tag and filter the content items and pages you have for it. The number behind the tag tells you how many times you have already used it. If you selected a specific tag, it is highlighted. Search results for: The tag you filtered on is displayed. Images: Displays only images tagged with that particular tag. Pages: Shows only results from your pages. Collections: Retrieves only collections that you tagged. Sort results by: You can sort the results by their name or creation date. The default sort order is by name. The title of a resource, its description if available, its associated tags, creation date and time as well as the type of resource are displayed. Click the Edit this tag button to make changes to the tag that is currently the filter. Click the Edit tags button to make changes to your tags without having filtered for a specific tag just yet. 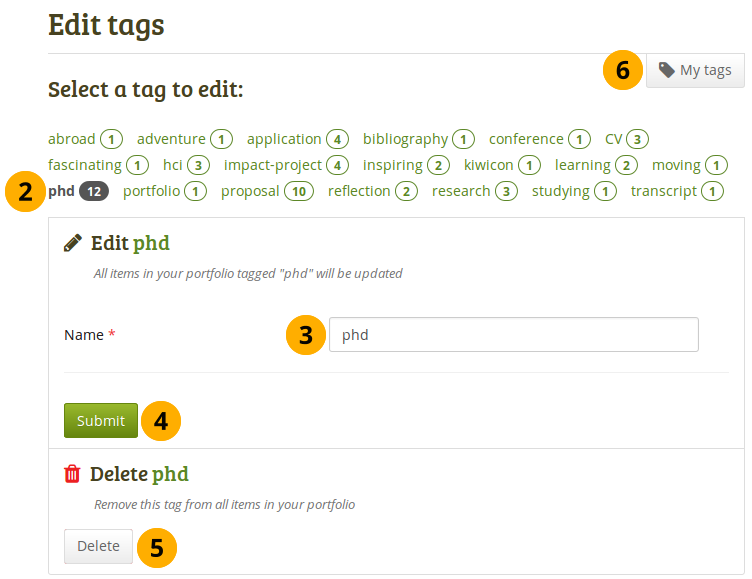 You can edit your tags to correct spelling mistakes or delete a tag. On the My tags screen, click the Edit tags button. On the Edit tags screen, you can then click the tag that you want to edit. Once you have selected your tag, it is highlighted in the list and you have more options available on the screen. If you clicked the Edit this tag button on the My tags screen, the tag is already selected for you. Name: You can provide the new name for your tag by replacing the old one. This field is mandatory. Click the Submit button to save your change. Alternatively, click the Delete button to delete this tag entirely. All occurrences of it will be removed. The items themselves that were associated with the tag are not deleted though. 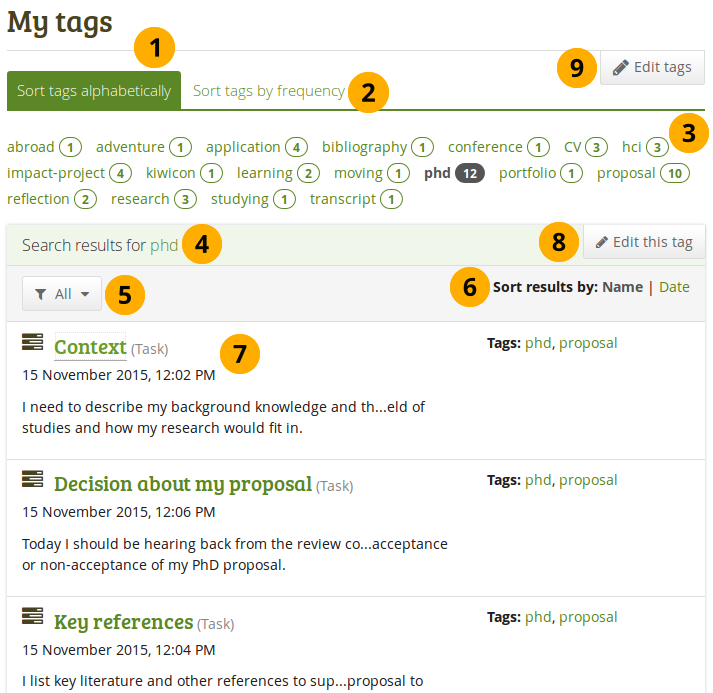 You can click the My tags button to be taken back to the overview page of all your tags and their associated resources.